Regretfully, the HELLP syndrome begins rapidly either before or shortly after a delivery, is aggressive and is one of the leading causes of maternal death. The admitting physician (Dr. April Kepner) was distraught because she obviously missed the diagnosis. 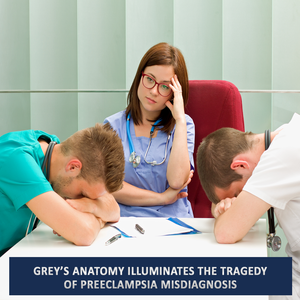 She later learned that the deceased patient’s blood pressure had been “low” during her pregnancy so when it was “normal” on hospital admission, it was really elevated and thus began the journey of a medical misdiagnosis. Tragically, the Center for Disease Control (CDC) reported over 5,000 maternal deaths of women who delivered within a year of giving birth from 2011 to 2013. This represent an increase in maternal mortality from 7 percent to 15 percent. Despite these dismal statistics, there are things that clinicians can do to fight this battle which include being more proactive by looking for this disease even before a patient is in a state of crisis. We, as clinicians can do better and we MUST do better. Too many women are dying.